I have read somewhere that people can live without water for much less than without food. Water is the foundation of our life, but we drink water less and less. We replace water with various drinks ranging from tea and soda ending. Different juices are the most useful type of drinking liquids. Fruit and vegetables juice contains many nutrients which help to balance our nourishment. In today’s article we will focus on what juicer is the best to buy, because the juices from the juicer are the really natural and healthy product. A juicer (squeezer, juice machine, juice maker) is a special device for processing fruits or vegetables to obtain juice. Hand juicer. In hand hand device juice obtained with a hand effects on treated materials. Mechanical juicer (juice press). In these devices, the impact on raw materials is made by means of mechanical devices such as lever or screw. Electric juicer. In this case, squeezing is made by using electricity and juicer motor. Depending on the raw material from which the juice is made, these devices are divided into citrus juicers and universal juicers. Already by the title we can understand that compact citrus juicer is intended only for use with citrus fruit and universal juicer can be used for the work with various fruits and vegetables. Incidentally, a juicer is a device with something similar in function to the dryer for vegetables. The task of dryer is to remove liquid from raw materials to dry it, fruit juicer features are also in the extraction of juice, but in this case it is the target product. Let’s consider at main features of the universal electric juicers, because hand juicers are the pretty simple devices, and mechanical are used less and less. Power, as always, plays a key role. Universal household juicer often has a power range from 120 to 1300 watts. A device with power of 1000 watts is comparable in this indicator with a meat grinder. 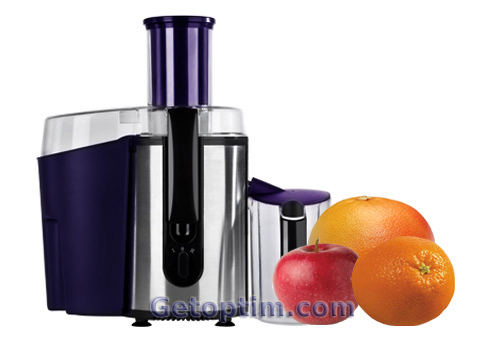 Citrus juicers have a slightly lower power, mostly from 25 to 80 watts. Choosing juicer focus you choice on models with 600-800 watts power, these devices have sufficient power to work with most products and use electricity sparingly. 2. Rate of juicer machine rotation. Juicer centrifuge rotation speed affects the amount of juice, which can be obtained from a particular type of material. Products with soft consistency (e.g. different tomatoes) require lower rotational speed than the “hard” products (such as carrots). It is very well if speed control present in a device. Most of squeezers models often have two speeds (high and low) with a special switcher, which helps to select the desired mode. Note the presence of the switcher when buying a juicer. Circular filter (strainer) in a juicer performs functions of separation of juice and mashed pulp. This filter must be made of stainless steel. In fairness it should be noted that squeezers manufacturers often try to fulfill this requirement, although the test of it does not hurt. It is also desirable that the filter would have small openings that will provide a greater degree of purification of the juice from the pulp. Some models may have several squeezers circular filter holes with different diameters, because larger holes let you get the juice with the pulp. Housing juicers often do of metal or plastic. Stainless juicers are more durable and reliable, but they are mostly more expensive. The plastic case is not as sturdy, but most cheap juicers and squeezers from mid-range are made with such body. Speaking honestly, you will not fill the big difference in use, so you cannot pay for the metal in stainless juicer. 5. Size of hole for supply of raw fruits. Raw fruits or vegetables are fed into the juicer through the special hole, the size of which depends on the size of the products or their parts that you can download. If this size is large enough, you can download, for example, whole apples or other large pieces of fruits, if this size is small the products have to be shredded before downloading. Squeezed juice is collected in a special tank (although in most cases other utensils can be used for this). The volume of it reservoir can be from 0.25 to 2 liters. The larger tank allows you to process more fruits without tank changing. The presence of foam cutter. This is a special device that helps to purify the obtained juice from foam. Automatic fruit pulp ejection. This feature can be applied to the main function. It helps to eject expeller automatically without disassembling of the device. Availability of automatic protection. This protection avoids accidental turn on of wrong assembly instrument. Please note one another moment – you need to clean you device after each use. Tips how to clean a juicer you can find in instruction to particular device. Such famous companies as Moulinex, Philips, Braun, Kenwood, Zelmer and others can be noted among the leading juicers manufacturers. You can stop your choice on one of those brands. Well, we have considered the basic parameters of juicers here. We hope this information will help you understand which juicer is the best.